On May 4th, Hip Hop and music in general, lost one of the greats - MCA aka Adam Yauch of the Beastie Boys. When I first heard Licensed to Ill, it changed my life forever and Paul's Boutique is probably my all time favourite LP. 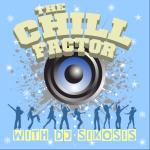 So, this week on The Chill Factor with DJ Sikosis, we pay tribute to the man MCA and the Beastie Boys.